Mar 15 2015 by J Simmons. This post was co-authored by Mach 30 volunteer Aaron Harper. The Mach 30 Reports Hangouts experiments have continued in February and March. Our new format is a round table discussion of current events in space, making, and open source hardware, with a focus on events happening at Mach 30. This new format is paying off and the result is this month’s reports hangout is well worth the time required to watch. This month, we have a report on Alicia Gibb’s book Building Open Source Hardware in which some Mach 30 members and projects are featured. We had some HUGE news in the form of contributions to open source design software and great strides on simplifying export control compliance for open hardware projects. Check it out below. For those that prefer a written update on the status of Mach 30 projects, you can still check out the March Reports page on Google Drive. Many of these topics from this month will have periodic updates. Naturally they will be covered in the new and improved monthly reports hangouts at Mach 30, so STAY TUNED! Sep 12 2013 by J Simmons. One of the things I look forward to the most every September is the Open Hardware Summit. From the first year, the Open Hardware Summit has been a critical event for Mach 30 team members to attend, and 2013 is no exception. This year involved a number of firsts for Mach 30 including our first opportunity to speak at the Summit, another speaker mentioning Mach 30 and its work, and meeting makers who are using Open Design Engine to host their project. Perhaps the most exciting part of the Open Hardware Summit (at least personally) was being included as a presenter. As part of our work to develop export control policies to deal with ITAR and similar regulations, the Export Control Task Force decided to submit a proposal to give a presentation on export controls and open source hardware. The topic was accepted by the Summit organizers for its timeliness (Defense Distributed’s 3D printed gun has thrust the topic into the limelight) and the quality of the task force’s export controls research. I must say the task force did a great job preparing the materials, and I can’t thank them enough for all of their support. And I am happy to report our message of preemptively addressing export controls was well received. For those who missed the presentation, we expect the Summit organizers to post videos of the presentations and we will be sure to share the video as soon as we see it is posted. 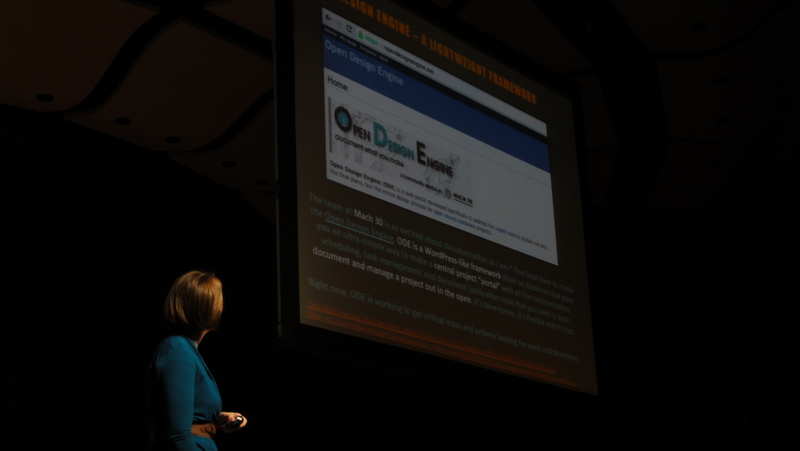 No less exciting for Mach 30 was seeing Open Design Engine (ODE) mentioned in someone else’s presentation. Mach 30 friend Amanda “w0z” Wozniak gave another impressive engineering process presentation . In previous years she has discussed the design process, and this year she discussed project management. As part of her presentation, she discussed the importance of project management tools, highlighting ODE for its lightweight setup and ease of use. She went on to create a project (a laboratory EKG pre-amp) in ODE as a living example of the value of sharing open source hardware projects on sites with builtin project management tools. She even found an answer to an unsolved design problem she had been working on as a side effect of publishing her documentation. Thanks w0z for using ODE and sharing your experience! Last but not least I got to meet Greg Austic and Robert Zegarac in the Open Hardware Summit Demo Hall. 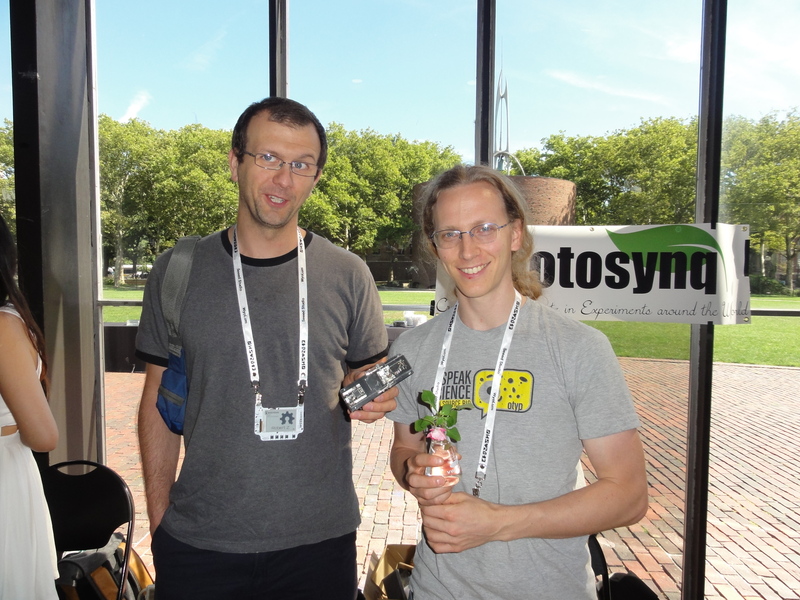 Greg and Robert are working on a hand-held, low cost, open source photosynthesis measurement platform called Photosynq. Photosynq is hosted on ODE, and this was the first time I have been able to see (and touch) hardware developed outside the scope of Mach 30 which is hosted on ODE. It was a real thrill to see hardware come to life which was birthed on our project hosting portal. Congrats to Greg and the whole Photosynq team. Keep up the great work. Jul 29 2013 by J Simmons. It’s been a very exciting month at Mach 30. We have made amazing progress on the Shepard Test Stand, gotten accepted to speak at a conference, and exhibited at another. If life were a video game, Mach 30’s volunteers and partners would have just earned a whole slew of achievements. Check them out. This month, the Coca Cola Space Science Center (CCSSC) became the first group outside Mach 30 to build a Shepard Test Stand. I am particularly pleased with this achievement since it is such a concrete demonstration of our open source principles at work. Here’s CCSSC sharing it with us over a Google+ Hangout. I’m not the only one who is happy about this news. Here’s what Matt Bartow, the educational services support specialist at CCSSC, had to say. “Congratulations to all of you at Mach 30, because I know you were very excited about seeing the first one externally built. It was a great success, and thank you for all your help through our build process. We will start posting our data, and, as we begin using it for student educational programming, we will also be posting about that as well. This achievement actually goes to our friends at CCSSC. Not only did they build their own copy of the Shepard Test Stand, but a few days later they successfully fired it. Plus they were able to collect data from their tests and as you can see below, it looks very good (the flat spot in the graph is from a known bug in the Data Acquisition (DAQ) software which should be fixed shortly). Congrats to CCSSC and the Shepard project team! I am also happy to announce that Mach 30’s Export Control Task Force has had its presentation on Open Source Hardware and Export Controls accepted as a topic at the 2013 Open Hardware Summit in Boston. The format for the presentation is a 6+1 (6 minute presentation followed by 1 minute for questions). The task force is currently working on the presentation materials, which of course will be openly licensed. Stay tuned for more details. To top off the month, I was able to attend New Space 2013 where I ran Mach 30’s booth. This is the first time Mach 30 has exhibited at a major space conference, though not our first exhibit experience (we have taken the Shepard Test Stand to both the Open Hardware Summit and a regional Maker Faire). Thanks to the hard work of our volunteers, Mach 30’s booth included display materials and two hardware projects: Shepard and the first ground station prototype. Sadly, due to fire restrictions I was not able to run a test fire on Shepard at the conference. But New Space and Mach 30 are already talking about what needs to be done to conduct test fires next year. Look for a complete report on the conference later this week. Oct 25 2011 by J Simmons. One of the first questions people ask when I talk about open source spaceflight is “What about ITAR?” It’s no wonder. Nearly everything to do with spaceflight technology is export controlled, making it illegal for US citizens and permanent residents to openly share spaceflight hardware and its supporting documentation. Needless to say, ITAR is a significant challenge for Mach 30 and other open source spaceflight groups. I’ve spent a lot of time thinking about how Mach 30 might approach these challenges. The short answer is obvious. We work within the boundaries of ITAR. That doesn’t mean, however, we are abandoning are open source values. The long answer is we need to develop a combination of approaches to openly publish as many of our projects as we can, while ensuring we are fully compliant with the requirements of ITAR. To that end, I’ve come up with four potential paths that might allow Mach 30 to develop spaceflight hardware in a (mostly) open way, while still staying in full compliance with the restrictions placed upon US based persons under ITAR. The first approach to dealing with ITAR, and in the early days the most noticeable approach, is running quasi-open source spaceflight projects. Mach 30 could host all of its spaceflight projects on a private copy of Open Design Engine, access to which will be limited to individuals who we have verified are US persons and who have received appropriate ITAR training in order to comply with ITAR. If you look at the formal definition of open source hardware, one of the requirements to be open source hardware is providing unrestricted access to the design documentation. Our space projects will fail to meet this requirement due to our insisting people agree to follow ITAR in order to gain access to our designs, hence calling them quasi-open source. The second approach is crowd sourcing a catalog of the large body of published spaceflight technology. Why is this important? Simply put, any technology which is already published in public literature is exempt from ITAR. Let me repeat, if you can find a public article, book, or other source which fully documents a piece of spaceflight technology, then that technology cannot be withheld by ITAR. And, it turns out there is a large body of scholarly articles, textbooks, and government reports, especially from NASA, covering spaceflight technologies. Mach 30 could launch a new wiki to catalog, tag, and for openly licensed materials, archive publicly available materials concerning spaceflight technologies. This new wiki will be a public resource to help identify which projects need to be quasi-open source, and which can be fully open source. The third approach is developing technologies as part of fully open source projects in non-space disciplines. Many core systems which are important for spaceflight are also applicable to non-space applications. Examples include power management, sensing, and command and control. By developing these systems in non-space applications, we could avoid the ITAR triggers and still develop the systems in full compliance with the definition of open source hardware. Projects could include solar powered robots to develop power management systems, autonomous Remotely Operated Vehicles (ROVs – remote controlled submarines for underwater exploration) to develop sensors and their related systems, and high altitude balloons to develop command and control systems. Once the technologies have been developed in these fully open projects, they can be ported into the quasi-open projects for use in space applications, but the core development will still be available in the non-space projects. The fourth and final approach is to establish partnerships with non-US groups and to develop approved technology transfers. One such group Mach 30 is already discussing this approach with is CSTART. CSTART is an open source space organization which started during an online discussion at reddit.com. Its membership includes people from all over the world. At a recent joint meeting on ITAR, CSTART and Mach 30 discussed CSTART becoming a non-US group and its US members joining Mach 30. Both groups could then work within ITAR and other export control regimes, while they investigated the processes required to transfer technology into or out of the US. We imagine it will be easier to transfer technology into the US, but we will work diligently to find opportunities to legally transfer technology both ways. So,where once there was the big scary ITAR, we now have a potential path forward for open source spaceflight. Please share your ideas for additional paths, as well as potential pitfalls of these suggested paths, in the comments!